We’ve just published a new research paper ‘Alibaba & Tencent: China’s Digital Disruptors’. Both Alibaba and Tencent have created formidable Internet ecosystems within China. However, the increasingly competitive Chinese economy is now slowing, and their continued growth depends on weakening the control of Google, Facebook and Amazon over the global digital commerce market. In the first of two reports on China, we examine Alibaba and Tencent’s services, business models, and aspirations, and explain how and why telcos should support their international expansion. The report is part of the Dealing with Disruption stream, and you can read an excerpt of the report here. Do network investments drive creation & sale of truly novel services? We’ve just published a new research paper ‘Do network investments drive creation & sale of truly novel services?’. Enthusiasm for creating novel so-called “digital” services is pervasive in the telecoms industry. There is a major shift afoot in the way telcos create, integrate, sell and manage value-added propositions. But how much is enabled by - or dependent on - the network itself? In recent years, most investment has been solely for improved connectivity, but there are signs that future network capex might drive new service opportunities directly, rather than just by empowering 3rd parties. The report is part of the Future of the Network stream, and you can read an excerpt of the report here. Smartphone Roundup: HTC “worth less than its cash”; Lenovo struggles in Q2; new Samsung flip phone! European Carriers: Orange.es ups prices; OFCOM OKs BT-EE on one condition. Well, two. VodaFixed. AT&T: SDN is paying off already via faster sales cycles, CAPEX savings. MBB price cut. NSA surveilance. John Donovan, AT&T’s technology chief, says their SDN transition is already paying off. For example, the cycle time to set up a new managed Ethernet link under their Network on Demand product is down 95%, to an average of 3 days for customers where no wiring work was needed and, perhaps even more impressively, down 82% to 15 days for customers where the carrier needed to pull fibre. Very interestingly indeed, Donovan suggests that their transition to SDN is also a transition to open-source software - the 75% SDN by 2020 target goes with another target of 50% open-source by the same time. The operator also issued CAPEX guidance, setting a target of 15% of revenue going forward. If this is going to be achieved this year, AT&T will have to spend significantly more in H2 than it has done so far; the explanation is that they intend to make a $3bn investment in the Mexican network they just bought. Ex-Mexico, they’re averaging about 12%, down from a peak of nearly 20% at the height of the 4G rollout in Q4 2013. 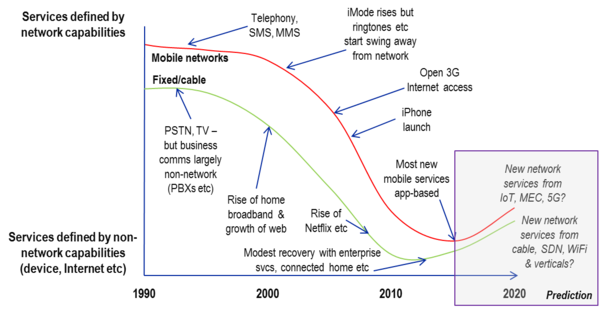 This strongly suggests that SDN (or NFV) is going to be a deflationary experience for the telecoms vendors. Meanwhile, they’re basically giving up on the U-Verse TV platform and concentrating on developing DirecTV’s CPE into a box that includes satellite, “LTE backup”, and “third-party broadband connections”, suggesting they’re hoping to use it to get into homes where a competitor’s broadband is present. There’s also a new backend coming, presumably to be deployed on all those SDN nodes. LTE fixed-wireless as a backup link seems to be a thing; it’s part of the $150m deal they just snagged with Marriott for managed hotel broadband, VoIP, and mobility. That must be especially satisfying, as the customer had signed up with Verizon as recently as December. AT&T Mobility tweaked its Mobile Share Value tariffs this week, keeping a device subsidy option but adjusting the data bundles. Doing the sums, the changes add up to about a 10% per-GB price cut - but if you want a subsidised phone, you’ll have to pay a $40 charge for each device that shares the data pool. Non-subsidy users stay at $25/gadget, so that’s a substantial giveback. Also, despite the cut, AT&T mobile data is still about a third dearer than T-Mobile’s. And extensive details have emerged of just how closely AT&T cooperates with NSA surveillance. Here’s a thing. Softbank Samurai Son selling Sprint so soon? Not quite, but it seems Son and his ex-Googler right hand, Nikesh Arora, spent part of last year hawking the operator around. Specifically, they approached Comcast CEO Brian Roberts about a mobile-cable deal, before having a go with Altice. Son says he made one of the biggest misjudgements of his life, “the misjudgment of the US regulatory environment”. Son had a plan that was initially rejected as impossible by Sprint’s equipment vendors. “They came up with hundreds of reasons why it cannot work,” he said. “I said: ‘OK, I will find a solution to each one of those 100 reasons of why it cannot work.’ And I came up with a very logical solution to all of them.” Sprint is now deploying thousands of small cells to improve coverage, costing less than a conventional network upgrade. He’s got a vision. About the network. They could call it a…Network Vision? Aside from catastrophic network upgrade projects, Sprint is also famous for paying its executives top dollar. CEO Marcelo Claure has trousered some $22m in his first nine months, and Softbank just extended his contract until 2019. That said, it’s rather less generous than the one that notoriously made Dan Hesse the best-paid man in the industry while Sprint fell behind. Most of it consists of 10 million shares of stock, and the earn-out is pretty challenging - they don’t vest until the share price passes $8. It’s currently $3.85. If that happens it might even be worth keeping Sprint shares. A couple of network strategies and CEOs, and many billions of dollars, ago, Sprint was all about tri-band LTE. That’s how they were going to finally make use of all that 2.5GHz they - well, the cablecos, Google, and Intel - paid for way back when. Now, Bell Canada has actually deployed it. They’re using 700, 2100, and 2600MHz together, for a theoretical maximum of 290Mbps. Being Canadians, they also say you should expect between 12 and 87Mbps in practice. Which isn’t bad. Telus wants its CEO to move to western Canada. He refused. They have a new CEO. VZW has quietly stopped throttling down heavy 3G users, having also backed out of throttling 4G users who still have an unlimited plan. Their Telematics M2M division, meanwhile, has retained Mercedes-Benz as a customer for another five years. Note that they actually provide customer support, but the customers think they’re talking to Mercedes - M2M is inherently B2B2C even when it’s not just wholesale. They’ve also started offering free calls between VZW and their VoIP for enterprise customers who take the Wireless Connected VoIP product. In the fixed world, Verizon has been testing the next iteration of GPON with equipment, oddly enough, from Portugal Telecom’s R&D wing. This uses four different optical wavelengths to provide up to 10Gbps over 5km, and importantly, the tests demonstrated that it can interoperate with the existing GPON kit. Frontier has announced a 10/100Mbps tier for the networks it acquired from AT&T. This is still copper, so expect that to be “up to” and restricted to short runs. TWC says it has backhaul to 20,000 cell sites. IHS reckons carriers will spend $5.7bn on SDN in 2019, up from $103m in 2014. It’s worth noting that they draw a hard distinction between SDN and NFV, so their forecast for NFV is additional to that. Here comes Rift.io, a startup that just exited stealth mode with $16m in funding, aiming to create a hyperscale NFV platform based entirely on open-source components. It aims to run a Red Hat-style business model based on selling support for the free code. Cisco had a strong quarter. Net income was up 6 per cent on revenue up 4 per cent. The pick of the business was data centre gear, aka exactly where the SDN/NFV wind is expected to blow hardest. But sales were up 14%. Note that Chuck Robbins is expecting flat telco CAPEX, just like AT&T and indeed STL. Adtran is offering a virtualised NFV implementation of its “most valued” products, apparently routers, firewalls, enterprise SBCs, and voice quality instrumentation. PT’s research arm figures in four EU 5G projects, and they look distinctly SDN-y. Here’s a fantastic High Scalability post on Google’s data centre networks. Note that the sheer volumes of intra-data centre traffic are getting hilarious, as in, “bigger than the Internet”. Also, data centres are physically too big and expensive to upgrade if that means building work. And the future seems to be hierarchical networks of cheap switches, physically distributed but logically centralised through SDN. There’s a talk at the Open Networking Foundation conference, too. Meanwhile, Google has two new cloud services, Cloud Dataflow and Cloud Pubsub. The first is an analytics engine for streaming data, the second is a message queue. The AWS Big Data Blog has a nice case study of doing the same sort of thing with AWS products. IBM, meanwhile, has launched Linux for mainframes, which are a sort of cloud when you think about it. Facebook has released more features for its OpenBMC cloud infrastructure management software, letting it take over more devices from the vendors’ solutions. Rackspace was hoping for growth in Q2, but it didn’t happen. Now they’re offering Amazon Web Services as a service, like they already do for MS Azure. They’re also doubling-down, joining an Intel-led initiative to support the development of OpenStack. About 100MW of wholesale data centre capacity has been sold in the US so far this year. And Switch’s latest monster DC has opened. The ribbon was cut by a robot, but the interesting detail is that it’s not actually any bigger than the last one they opened. It’s just missing an arrow pointing to the little “Ads” box, saying “This is where all the money comes from”. (Horace says something similar.) 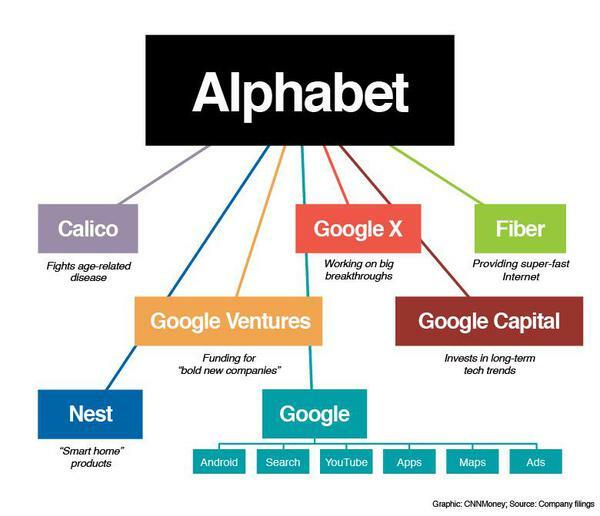 Also, Google Ventures and Google Capital seem to do much the same thing. That said, it’s going to be interesting to see what Google’s financial reporting looks like with the magic Internet glasses and space balloons stripped out. Meanwhile, back at the ranch, Android gets support for the new Khronos Vulkan API for direct 3D graphics rendering. Microsoft is previewing the Skype for Business apps for Android and iOS. Sysadmins could nominate up to four of their users on each OS to get the app free, up to the 14th of August. Hedge funds have been dumping Alibaba and Baidu stock in large quantities. That said, Ben Evans is trying to reassure everyone about the prospect of a tech bubble: US technology startup fundings are at about half the level of 2000. Facebook says it has more app developers in India than anywhere else. And the FBI is now investigating at least 12 deliberate fibre cuts around the Bay Area. Unlike most mad axemen, the fibre slasher of Silicon Valley can at least claim that they never hurt anyone. HTC “worth less than its cash”; Lenovo struggles in Q2; new Samsung flip phone! Right. Bloomberg Businessweek reports that the shares plummeted last week to the point where the company is valued at less than its cash at the bank, that is, its value is negative. That’s especially worrying as 34 per cent of its assets consist of either stocks of phones, or worse still, accounts receivable from the carriers. Lenovo reported Q2 pre-tax income down 80% year-on-year and operating profits down 67%, although revenue was up 3%. As a result, they intend to cut 3,200 jobs as soon as possible. They’re going to drop the non-Motorola smartphone lines and focus entirely on Moto Mobility, although they’re losing jobs too. Samsung announced a new, bigger version of the S6 Edge, this time powered by a Qualcomm Snapdragon 801 rather than an Exynos. They also launched Samsung Pay, their Apple Pay-like service. There was also a surprise: a dual-display, 3.9” flip phone harking back to the mid-2000s era of form factor experimentation. You’ve got to be Chinese if you want one. Apple Pay, for its part, seems to be struggling to get user adoption because a lot of iPhone 6 users don’t really understand what’s meant to be so great about it. Smartphone shipments in India are up 44% year-on-year, 19% sequentially. And the only growth in tablets is coming from 2-in-1 gadgets like Lenovo Yogas and Microsoft Surfaces. Orange Spain is calling the turn - it’s going to put up prices at the end of September, with two common plans going up by €2/mo. On the other hand, the data bundles increase by 500MB. Meanwhile, there’s some debate whether Italian or European regulators will accept the Three Italia/Wind deal - it’s pointed out that Three is the only operator there to add subscribers recently. OFCOM says it’s willing to accept the BT-EE deal, but it will impose conditions. Notably, it wants regulated access to dark fibre, like it says in its submission to the wider Communications Market Review. It’s also concerned, however, that the other MNOs are tied into long-term contracts with BT Wholesale, while BT could choose to waive the contractual restrictions for EE. The irony; mobile operators complaining that they’re stuck in a long contract. That said, the regulator also said that the European decision on Hutch-O2 would influence its decision - if they get the green light to create O3, OFCOM might block BT/EE. But then, the Eurocrats haven’t actually decided if they care yet. Vodafone UK’s fixed broadband service is here, although for the moment this isn’t a FTTH rollout but rather another ISP running over BT Openreach FTTC. O2 UK CEO Ronan Dunne thinks there’s something wrong with the UK market if DTAG, Orange, and Telefonica are all sellers. Virgin Media has thawed out its plan to put public WiFi hotspots in its street cabinets, which has been in the freezer for a few years now. Apparently we should expect a WiFi-centric announcement in a few weeks. The UK government is boasting about hitting its broadband target. If you read last week’s news you’ll know this is pure spin. It’s working so well farmers are building their own towers to get 4G and run cable to their homes. Interestingly, though, BT is handing back £129m of the money, risk underwriting it didn’t eventually need. 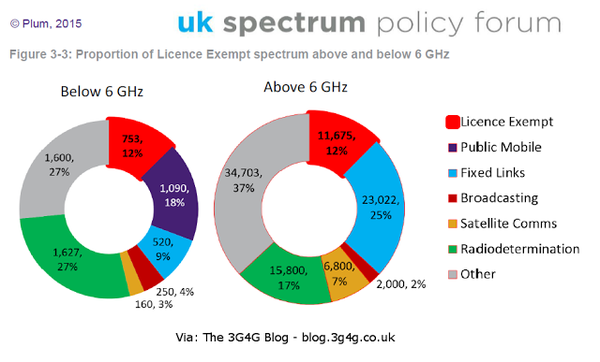 The oddball 1.4GHz spectrum Qualcomm owns in the UK has been sold to Vodafone and 3UK, after the EU decided it could be used for mobile downlink after all. Simwood is not happy about OFCOM. MasMovil bought the 720k FTTH lines Jazztel was forced to sell. TDC has a new CEO. Indian operators Uninor, Vodafone, and Idea Cellular are all in talks with Nokia Networks about their forthcoming 4G rollouts. Nokia is pushing its SingleRAN solution and also trying to get them interested in VoLTE, after they snagged Bharti Airtel’s 1800MHz 4G build. Singtel reported a decent Q2, with net profits up 13% year-on-year although revenue was down 1%. Singaporean and Aussie 4G data was the main moving factor. Xavier Niel’s MyRepublic is expanding from Singapore, into Australia, where it intends to offer 100Mbps FTTH for about $60/mo where the NBN is actually fibre. They also intend to badger the NBN Co to build out more FTTH. Break out the popcorn; Niel vs. Aussies sounds like great TV. Oi’s Q2 revenues were off 3% and EBITDA came rattling down, 20.3% year-on-year, as the company extricated itself from the whole mess around PTel. And the WACS cable around West Africa has been upgraded by Huawei to 100Gbps capacity. Apple’s TV service might not launch this autumn after all. Apparently the launch of the new Apple TV hardware is still going ahead, and it’s pencilled in for the 9th of September. The new service, though, is held up by the negotiations between Apple and the TV networks, especially CBS and Fox. Price is said to be the issue. DTAG is selling up its content portfolio - both InteractiveMedia and the t-online.de websites have been sold to German advertising firm Ströer for €300m in shares. They aren’t giving up, but rather concentrating on aggregation rather than own content. BT has quietly added a £5/mo charge for part of its BT Sport package. OFCOM ordered them to give customers a month to decide whether to eat it or downgrade to the Sport Lite option. Dan Rayburn argues that HEVC users should refuse to pay the patent pool a penny. Oracle’s chief security officer blogged that their customers should stop trying to find or report security issues, because they know best, and that’s what it says in the licence agreement. It went down about as well as you might expect. Here’s a way of using BitTorrent and similar P2P networks as a massive distributed denial of service cannon. It’s good luck it’s only been discovered now, not five years ago when everyone used them and the potential mayhem was that much worse. A wide range of cars have a serious security flaw in the wireless key. Volkswagen sued the discoverer. 42% of British car thefts now use the flaw. Google has updated Hangouts to provide protection against Stagefright. But the fix for Android itself turns out to be flawed. 14 Microsoft security bulletins for five dozen bugs. It must be Patch Tuesday. And here’s an effort to fix IoT security. When Amazon Web Services began deploying in Australia, it was widely expected that the unique hosting ecosystem dominated by Telstra was about to go through a massive disruption. However, Telstra’s Network Applications & Services division is growing strongly, and the company’s groupwide EBITDA margin is comparable to that of Verizon Wireless. The following chart shows NA&S grew at a 22% annual clip from 2009 to end-2014. 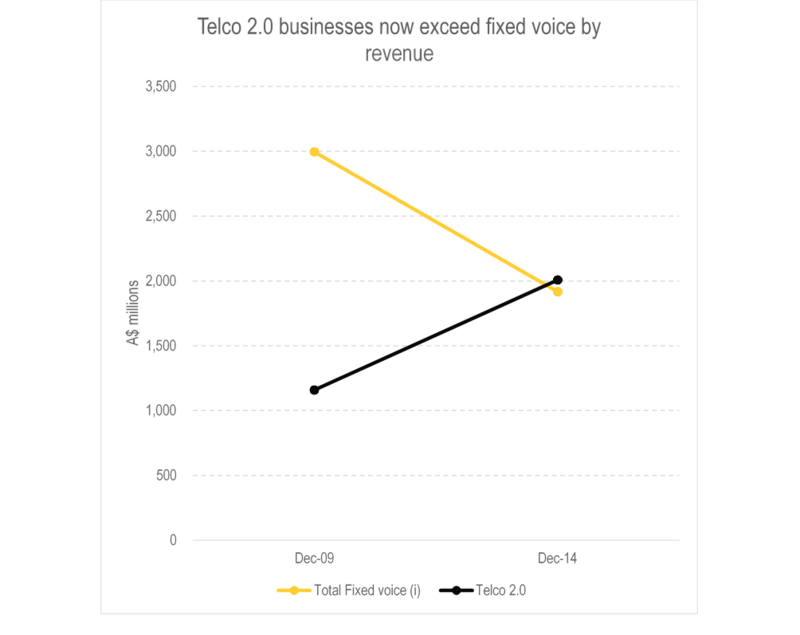 At the end of 2014, their combined Telco 2.0 businesses overtook fixed voice as a source of revenue. Telstra is a fascinating case study of strategic agility in a market with unique constraints and opportunities. In our latest Telco 2.0 Executive Briefing, Telstra: Battling Disruption and Growing Enterprise Cloud & ICT , we cover their strategic pivot from primarily reselling VMWare and Microsoft Office 365 to an “all of the above” strategy covering OpenStack and Cisco Intercloud technology, as well as VMWare vCloud and Microsoft Azure, and analyse their risky but innovative foray into e-health systems via the acquisition of Dr Foster. The drumbeat about a Nokia re-entry to smartphones continues. Reuters reports that the company is aggressively signing up software engineers with Android skills and looking for joint-venture partners. Apparently there are no plans to resume manufacturing devices, which would be outsourced to the partner. This, of course, would be a disadvantage compared to Apple, Samsung, or Lenovo with their command of the supply chain. However, a software-focused strategy might be a way to get back in with minimal investment. Apple, meanwhile, has vigorously denied planning to launch an MVNO building on the soft-SIM it introduced for recent iPads. The closest comparison is of course Google’s Project Fi. Here’s an unboxing experience with it. The idea of unboxing a service sounds odd, but it turns out that Google gives away quite a bit of hardware with the SIM card, notably a new headset, an external battery, and a Project Fi case for your phone. Speaking of Google, they are going to “relaunch” Android One, the stock-Android initiative for emerging markets and specifically for India. The problems with it include a shortage of the devices, which are mostly imported from Chinese ODMs. Ironically, the biggest Chinese Android maker, Xiaomi, seems to have been quicker to start manufacturing in India than Google’s India-focused project. The first handset made there is being launched today, and both Xiaomi and Foxconn are investing heavily in Indian factories. Here’s a positive review of the third iteration of the Motorola Moto G. It still sounds like great value. HTC’s predicted ugly Q2 was ugly, and the company made a £120m net loss. Apparently they think their devices aren’t “fashionable” enough, and they may choose to focus on the flagship segment exclusively. Kantar Worldpanel has Apple crushing it in terms of market share everywhere they looked, although Canalys thinks Lenovo pulled ahead in PC shipments. That said, it would be a reasonable guess that Apple is far, far ahead in terms of PC profitability. And Microsoft has released its toolkit for Windows 10 apps as open source code, in an effort to encourage porting of iOS software. If Apple doesn’t want to sell you mobile service, it certainly does want to sell you streaming music. Apple Music has apparently signed up 11 million users to the trial, of which 2 million have picked the top tier $14.99/mo plan. The kicker is that so far, none of them are actually paying over any cash, as the free trial period runs until October. If they are all converted, that’s more payers than Spotify has, but that’s a significant “if.” Meanwhile, the App Store shifted $1.7bn in inventory in June, which takes the total payout to developers to $33bn since the beginning. Meanwhile, music recommendations site This Is My Jam is shutting down, going read-only rather than just erasing everything, but shutting down just the same. Its 200,000 users will be able to download all their stuff, and the code base is being released into open source in case anyone can think of something useful to do with it. They blame increasingly complicated geographic licensing and the burden of keeping up with breaking API changes at other music services. IPR is a pain. Just ask Sky TV, which had to interrupt a broadcast when it was served with a copyright notice…from Fox News, which is hilarious as the two companies are both part of the News Corporation empire. ROK Mobile, the music-focused MVNO, is coming to the UK, using 3’s network as part of Hutchison’s broader push into wholesale. For £25/mo, you get a SIM only deal with 4GB of data, open slather voice, texts, and streaming, and 2000 track downloads from a catalogue of 20 million. Note that the music isn’t zero-rated, so it comes out of the 4GB data bundle. In the US, the data pill is sweetened with access to Devicespace’s WLAN hotspot portfolio - there’s no mention whether anything like that is available here. AT&T has started offering a mobile and TV plan now it owns DirecTV. $160/mo gets you four phones, 10GB of shared data, plus TV for four TVs and streaming to the phones. Fixed broadband is extra. And here’s some interesting backstory about Google +. It seems the motivation was diffuse fear of Facebook, which is ironic when you think that Facebook’s biggest success versus Google seems to be just serving fewer ads and charging more for them. HTC One Max phones store fingerprint information in a folder any app can read. Also, the file name is always “dbgraw.bmp”. Research presented at BlackHat this week suggests quite a few other Android devices may be affected because the OEMs didn’t bother to use the ARM Trusted Zone API or equivalent to store the biometrics. It’s yet another Android security problem. The problem is the remorseless fragmentation of the Androsphere - OpenSignal reckons we’re up to 1,300 distinct Android OEMs now, and 24,000 distinct devices. This diversity reflects the enormous creativity of open-source software, but it doesn’t half make it difficult to push out security patches. And a big part of the problem is how long obsolete versions stick around. Interestingly, if you’re worried, the best option might be to use one of the indie ROMs like Cyanogen, as they manage their own updates without involving carriers or OEMs, rather like a normal Linux distribution. 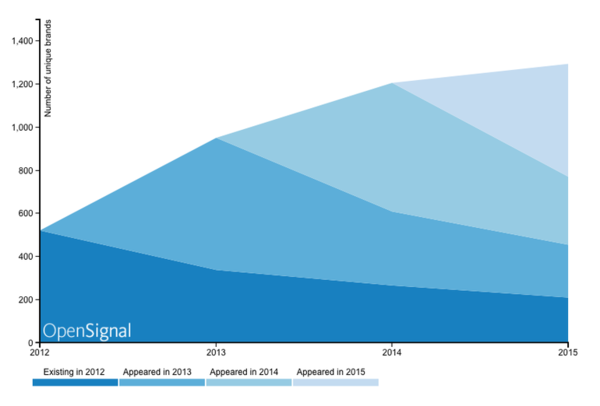 There are now more Cyanogen users than either Windows Phone or BlackBerry, so this shouldn’t be all that scary any more. Google is desperately trying to herd the cats. This story says it all. Google itself, Samsung, LG, Alcatel OneTouch, and Motorola have all now agreed to push out patches for the Stagefright vulnerability. Moto says it’s going to ship code this week. When the update actually hits, though, depends on the carriers, who are notoriously uninterested in Android updates. There are just too many people with a veto. On Saturday afternoon, Carphone Warehouse admitted that hackers had stolen 2.4 million customer records and 90,000 credit card numbers. The CCs are at least encrypted, but it’s an enormous embarrassment for a company that rightly prides itself on its point-of-sale software and its standards of customer service. Also, a lot of CPW IT is linked to carriers’ OSS, vendors’ activation systems, and the like. Further, their Connected World Services division white-labels their technology for a whole range of other mobile industry players. Sprint was the most recent, but CWS customers also include Best Buy and, um, the Apple Store. CPW claims the lost data came from three of its web sites - mobiles.co.uk, onestopphoneshop.com, and e2save.com - which in turn are brands of its three MVNOs, Talk Mobile, TalkTalk Mobile, and iD. In case you missed that, the compromised system therefore has interfaces with 3UK, O2, TalkTalk, and at one remove, BT Openreach’s wholesale systems as well as the UK carriers’ retail OSS. Also, all the various CPW web sites, including CWS, are hosted in the same Rackspace data centres. Interestingly, at the time of writing, OneStopPhoneShop.com was down. Three other UK retailers - Boots, Superdrug, and Tesco - are going to be allowed to see medical records from the NHS. What could possibly go wrong? Back at BlackHat, it turns out that industrial Ethernet switches are hideously vulnerable and there’s a new way to get at your stuff in the cloud by stealing password tokens. Google Beacons can be hacked to broadcast a different URI. T-Mobile is listed as a customer by Flash Networks, which these days specialises in injecting extra adverts into web pages on mobile operator networks. T-Mobile angrily denies it, saying they only use them to fire billing alerts. Meanwhile, Flash sues an Indian user for saying publicly where the ads are coming from. If you thought the SS7 signalling vulnerabilities were bad, try the DIAMETER ones. EFF has produced a detailed technical specification for Do Not Track. Did EE know its PowerBar chargers might catch fire? And here’s an app to turn off all the creepy bits of Windows 10. The FCC has published the 600MHz auction NPRM. The auction is scheduled to begin at the end of March, and although T-Mobile didn’t get the spectrum carveout it wanted, 30MHz is still going to be reserved for operators with “sparse” holdings below 1GHz. T-Mo wanted 40MHz. Also, there’s a cap at 20MHz for any single operator in a partial economic area with a population of less than 500,000, which sounds like it’s intended to keep the rural/regional operators in the game. Importantly, the spectrum reserved for smaller operators includes most of the bands that aren’t affected by the whole duplex gap issue and therefore are less likely to be subject to interference from TV stations. AT&T really isn’t happy about this. Someone else who isn’t happy: the Satellite Cowboy himself, Charlie Ergen. The FCC (or should that be Lawman Wheeler?) seems to be taking its inquiry into the AWS-3 caper, when DISH used two shell companies it controlled to snag a $3bn discount on spectrum intended for small businesses, very seriously indeed. DISH is looking for a response. File a lawsuit? Come clean, and pay the whole whack? Or stiff the Feds and refuse to pay even one red cent? Well, we know which is the most cowboy of those options. But Ergen seems to be leaning towards “pay up and look big”, not least because if he does anything else, it will be a long, long time before he or anyone else will be free to use or even sell the spectrum block in question. Which reminds us: why is there a small business discount on a $10bn block of spectrum in the first place? What kind of small business can afford $10bn of spectrum, or build out a network to use it? Meanwhile, the FCC has also decided to open up the 600MHz whitespaces for unlicensed use, subject to noninterference requirements. This is a bit of a mixed blessing, as depending on how the auction turns out, some of the space might have to be given back. Public Knowledge comments. Elsewhere, the 3G, 4G, and 5G Wireless Blog says we need more unlicensed spectrum for the Internet of Things. It’s that time again: the OFCOM Communications Market Report is out. Inside it, OFCOM claims that 90% of UK households have access to “superfast” broadband, hitting the Government’s target. ACHIEVEMENT UNLOCKED. But as ThinkBroadband points out, superfast is defined here just as being on BT’s FTTC network or Virgin Media’s cable. Only regulators could define the word “fast” without reference to speed. Substantial numbers of people on FTTC don’t actually get better speeds than ADSL2+, so the real figure is 83%, and therefore a miss. GAME OVER. In the six months to February 2015, BDUK spent five million quid on those adverts that looked just like BT Infinity ones. In Q1 Sprint just managed to keep ahead of T-Mobile by pushing out a ton of low-value M2M devices and changing their reporting basis, but in Q2, it was just too much. T-Mo is now 3rd in the US and profitable with it, while Sprint made a $20m net loss in the quarter it fell 1.2m subscribers behind. In some ways it wasn’t such a bad quarter - 675k net adds versus 220k net losses the year before - it just wasn’t enough to match T-Mobile’s 2.1m monster. Service revenue was off by $680m year-on-year. Sprint blames this on the shift to making more revenue from device sales, but then, they were profitable a year ago. As a result, the CFO is leaving, to be replaced by Tarek Robbiati, a leasing expert and ex-Telstra executive. The Chief Network Officer, John Saw, is being promoted to take over as CTO, but he’s going to report to a new COO of Technology, Günther Ottendorfer, formerly CTO of Telekom Austria. One thing that never changes at Sprint: weird management structures. Robbiati is wanted because leasing is suddenly a big deal at Sprint. CEO Marcelo Claure is planning to set up a leasing subsidiary that would both run their smartphone quick-upgrade plan, and also finance network investments. Claure hopes that this will make it possible to book the whole sale of a smartphone up front, as if it was a straightforward sale, but without having to also recognise credit to the customer. Very funky, and not at all desperate. Sprint is also offering a discount roaming plan throughout the Americas like T-Mobile’s. Verizon Wireless has decided to start charging separately for devices and incidentally end their family plans. As with unlimited, existing contracts are grandfathered-in although VZW will no doubt try its very best to get you to sign a new one. This is being sold as a move away from handset subsidy, but it will be interesting to see if, as with T-Mobile, subsidy persists via device pricing or whether VZW thinks it can call the turn on the price wars. They’re also buying a lot of dark fibre for their small cells. Something broke in AT&T’s backbone network and all four national wireless carriers were off line in parts of the US Southeast. Google Fiber’s next 1Gbps target is San Antonio, aka AT&T headquarters. Deutsche Telekom Q2s are here, and they’re interesting. Net profits were flat year-on-year, but revenues were up 5.7% in constant currency. As well as T-Mobile USA’s stellar Q2, the German mobile business chipped in with an 8.8% rise, mostly from smartphone sales. Total revenues in Germany were up 2.1%. Liberty Global reported that its Q2 ARPU was down 9%, but up 4.4% on a constant currency basis. Although Orange, Telefonica, Vodafone, and DTAG have all had a promising quarter, Telecom Italia was only just in profit on revenue down 3.3% year-on-year, after it had to eat a €400m regulatory charge over the behaviour of its wholesale division. TIM Brasil says 20% of its traffic is now 4G, data ARPU is up 42%, 59% of its users are on smartphones, and net income is…down 20%. 3 Italia and Wind are merging, in a deal valued at €21bn. NTT DoCoMo is offering a 225Mbps LTE-A product it calls Premium 4G in 292 Japanese cities. They hope to get to 300Mbps by the end of the year and 370Mbps in 2016, when 3.5GHz spectrum is available. The service is using carrier aggregation across 5 different bands. Bharti Airtel is planning to roll out 4G to 296 Indian municipalities before Reliance Jio launches in December, and the service will be priced at the same level as 3G. Bharti also has financial results, dominated by a 40% jump in headline profits. This is basically illusory, coming from the sale of African towers, but the underlying growth in group revenue of 3% is less so. Data revenue was up 56% while traffic was up 86.5%. Bharti is meant to be selling some of the African networks. You can see why; profits were up 14% in India, with a specially strong performance from Airtel Business, but flat if that in Africa. MTN’s revenue for H1 was off 4.9%. They blame currency movements, but the drill-down shows most of their markets were terrible, and the ones that weren’t are tiny. And Optus is going to switch off GSM in 2017. GE is launching a cloud-based version of Predix, its IoT analytics engine for monitoring industrial machinery. GE talks a big game about the “Industrial Internet”, and here’s some delivery. According to a survey for IHS, 82% of telecoms operators are already doing something with SDN, whether a real deployment, an evaluation, or a pilot. Here’s a proof-of-concept with OPNFV. Interestingly enough, AT&T, Clear Path Networks, and Dell are involved. Dell, the cloud company? Increasingly, it’s lines of business that want OpenStack, not IT directors. King, the mobile gaming company, uses Amazon CloudFront as its primary CDN. A special problem for Baidu is that the air pollution is so bad, they can’t use free cooling or the server failure rate goes up. The problem is keeping the clouds out of their cloud. Adobe Connect is moving to HTML5 and WebRTC, whenever “WebRTC is mature”. Microsoft Edge uses the Web Audio implementation from Chromium, and says so in the release notes. Is Apple planning a much better voicemail app built on Siri? The Register points out that if the rumour is true, the feature set is a lot like Orange Wildfire from 1999-2005. Huawei, Siemens, and Deutsche Bahn gear up to replace GSM-R.
Nokia Networks’ Q2s are in and they’re impressively strong, with net sales up 9% year on year and net profits ahead 60%. Further, Nokia’s gross margin is now higher than Ericsson’s, suggesting that Nokia’s increasingly edge-focused product line is doing something for them. Nokia’s partner in the forthcoming merger, Alcatel-Lucent, reported that its Q2 generated positive FCF for the first time since 2006 - in other words, the original Alcatel / Lucent merger has taken an awfully long time to work out. Overall, revenue was down 8%, but if you exclude managed services and some other stuff, it was up 6%. Why you should exclude managed services is another question. That said, the net loss is down from $298m to $54m and the company’s generating cash. Nokia is increasingly committed to a vision of mobile operators deploying cloud-based applications right down to the base station, enabled by NFV technology, with products like its Airframe servers and Liquid Applications software. Here’s an interesting article about deploying grid computing in the mobile network, using Nvidia Tegra K1 mobile chips and their GPUs to support high performance compute loads. The Linux Foundation-backed OpenDaylight SDN initiative claims it has 359 committers actively contributing code and that’s more than all the other SDN projects together. They also name AT&T, Orange, Tencent, the Large Hadron Collider at CERN, and Comcast as companies that have OpenDaylight in production. Cisco has named a new CTO and a “SVP and Chief Digital Officer”. We weren’t aware Cisco had much of an analogue business, but there you go. Padmasree Warrior is out as CTO-and-CSO. Ericsson and SK Telecom have signed a deal to co-operate on virtualisation and 5G “network slicing”. This will involve developing the first “5G ready hyperscale data centre”. We don’t believe hyperscale data centres have much of a place in a 5G future, but it’s telling that both Ericsson and SKT are thinking in terms of 5G’s impact on the cloud. Meanwhile, SK Telecom is also experimenting with the Internet of Ships. Here’s an interesting interview with the VZW engineer in charge of their small cells deployment in San Francisco. VZW is using dark fibre to reach a pair of Ericsson micro-RRUs per street lamp, pulling the control functions back to a data centre in a C-RAN setup. It’s the opposite strategy to distributing all the processing out to the base stations. Half the deployment is being carried out by ExeNet Systems. Despite that, their half-owner, towerco SBAC, is selling up because they don’t think there’s enough margin in small cells. Did you know CableLabs is leading the MANO cloud-management element of NFV as it goes through ETSI? Now you do. Rackspace is offering a new private cloud product, promising that the hardware is dedicated to you. Interestingly, seeing as Rackspace was a founder member of OpenStack, it’s based on VMWare vCloud. Digital Realty has acquired Telx, which means it’s now competing with one of its biggest customers, Equinix. Someone is doing Google Boat, but for real. And Telstra has decided to IPO Ooyala, the CDN they bought last August and which they’re still investing heavily in. Dan Rayburn rips the dodgy numbers in their S-1. Telefonica’s Q2s are in. Here’s the news: revenue was up 12.4% year-on-year, group-wide. And the company was profitable. In fact, net profits were up 70%…at a whole €1.89m. The Spanish business is still shrinking, but the rate is down to 1.1% year-on-year, while Brazil was up 4.5%, the rest of Latin America 10%, and the German business 67.8%. Chairman Cesar Alierta says the Spanish business was flat in May and June, the first months since December 2009 when the business didn’t shrink. Orange says its revenue grew in Q2 for the first time since 2011, by 0.4% as against -0.3% in Q1. The drivers were 4G adoption in Europe and subscriber growth in Africa and the Middle East. Orange France, for example, scored 240k net adds in H1 and beat forecasts for 4G adoption by 400k subscribers. Turkcell says it had its best-ever quarter in Q2, with revenue up 5.8% year on year, EBITDA up 9.7%, and net income up 44%. The carrier is gaining postpaid mobile and shedding pre-pay subscribers. Proximus reported group revenues up 1.5% in Q2, with EBITDA up 4.3%, and the BICS carrier services division up 34.9%. The CEO says to except 2-3% for the full year. Also, they would like to acquire a cableco. In the light of those results, plus Vodafone’s last week, you might be forgiven for thinking European telcos have turned the corner. Despite all the drama about Greece, various EU economic indicators (notably bank credit and car sales) are up strongly this year. 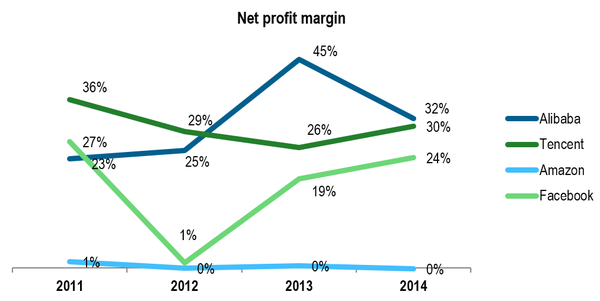 Fortunately there’s KPN to crush your optimism, with Q2 revenue down 5% year-on-year. KPN says consumer revenues were roughly flat, but enterprise fell off a cliff, and the firm had to eat a pension fund charge. It’s not hard to spot the problem: DSL connections for businesses dropped 19% and business voice 18%. It shouldn’t be hard to spot the solution: residential FTTH scored 135k net-adds. Telekom Austria, meanwhile, has had to cut its full-year forecasts from 2% to flat, but it’s got some ideas about how to fix that - buy a cableco. Mobiltel, its Bulgarian opco, is acquiring Blizoo, a cable operator with 373,000 subscribers and 1.3m homes passed. The GSMA needs a new boss. In the meantime, long-time CTO Alex Sinclair is filling in. Metronet UK is rolling out its gigabit wireless leased lines in Bradford. And Vodafone UK just added 63 4G roaming destinations, so for £3/day or £5/day outside Europe you can roam painlessly. This is probably them hearing footsteps from Carphone Warehouse’s iD free roaming offer. T-Mobile USA reported a substantial net profit for Q2, plus another crushing net-adds performance. A disturbingly wild-eyed John Legere announced 2.1m net-adds, including 1m postpaid, in Q2, plus revenue up 14% year-on-year and net profits of $361m. A year ago, T-Mo claimed a $391m profit, but that was more than accounted for by a spectrum swap transaction that flattered their profits by $747m and actually reduced their cash, so this is big news. T-Mo expects to be profitable for the rest of the year and to sign up 3.4-3.9m subs for the full year. Nikesh Arora, Softbank’s president of mobile, says they’re still committed to Sprint even though the drop into fourth place is now as good as nailed on. Gigabit cable watch: Videotron is planning to deploy 1Gbps, but it intends to do it with DOCSIS 3.1 on the cable network instead of pulling fibre. Ultra-low cost MVNO FreedomPop has snagged some investment from Malaysian operator Axiata, which is going to fund the launch of a new MVNO-plus product that won’t be branded either FreedomPop or Axiata or anything related to them. Ooredoo is struggling a bit - Q2 revenue was off 5% and net profits 39% year-on-year. They blame currency shifts and “security issues” in Iraq (that’s ISIS blowing things up, of course). However, mobile data is now 34% of the business and it’s fair to ask whether their data pricing is cannibalising the rest of the company. Saudi Mobily, meanwhile, reported a startling 57% plunge in its net profits after a dispute with Zain Saudi over a $300m bad debt, which fed through to a disappointing quarter at Etisalat. Zain, for its part, also had a distinctly shaky Q2, with revenue down 10%. Airtel wants to buy the old Celtel networks off Zain, and who can blame them for thinking they could do better? In the meantime, though, an executive clearout is in progress in their African operation. And all three South Korean operators reported. SKT was off a tad (1.2%) as interconnect pricing dropped. KT did a little worse. LG U+’s profits almost doubled, though, as CAPEX on its wideband-LTE network dropped out after the rollout finished. AT&T wants to fight the $100m fine imposed on it by the FCC over data throttling. The regulator charges that they used the acceptable-use policy to ease out customers who had a legacy unlimited-data plan and the right to keep it. AT&T claims it disclosed the policy, and everyone else is doing it, and $100m is too much. CTIA has filed its appeal against net neutrality, claiming that the FCC’s “heavy handed approach threatens US leadership in wireless broadband”. That might be interesting if it wasn’t for the fact that CMRS - i.e. cellular - has historically been subjected to a regulatory regime closer to the new one than to the fixed broadband regime pre-reclassification. Verizon and Centurylink both vigorously deny trying to withdraw regulated copper by stealth, in a letter to the regulator. Canada’s CRTC wants Canadian telcos to offer special access to their FTTH networks for competitors. French regulators have given the go-ahead for Orange and SFR to start refarming their 1800MHz spectrum for 4G, under one condition: they hand over part of it to Free, which only has 5MHz of the prized 2G/4G band. And ARCEP has also decided to stop operators using the word “fibre” unless they actually offer FTTH. In the UK, of course, both BT (and its wholesale customers) and Virgin are allowed to call their services “fibre optic” although neither of them actually offer it. Samsung Q2s - how soon will chips beat phones? World shipments numbers. New Motos. Nokia VR cameras. Samsung confessed that its Q2 was not so great. The Galaxy S6 devices didn’t sell as well as predicted, and as a result, Sammy has been discounting heavily. (And as a result of that, this blog now has a S6.) Meanwhile, they underestimated how many people would want a S6 Edge and struggled to keep them in stock. There was some good news, like higher ASPs, but revenue in the IT & Mobile unit was off 8.4% year on year. 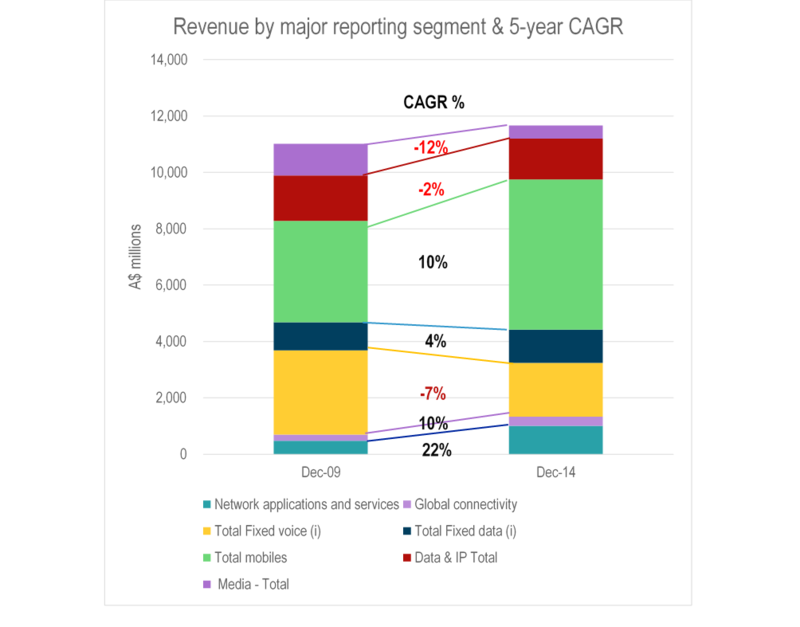 Also, the networks operation suffered from the end of the South Korean LTE capex cycle we noted above. 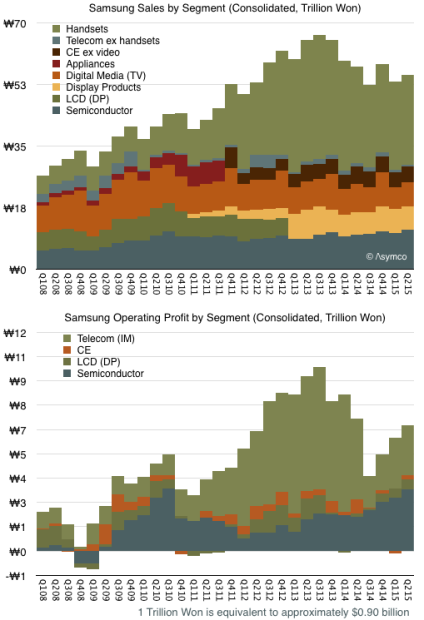 Horace asks an interesting question: how long until Samsung makes more money from Apple iPhones than it does from its own products? They seem to have substantially more pricing power in semiconductors than they do in finished gadgets. As a result, Apple is getting ever closer to overtaking Sammy for shipments, while Huawei is firmly in third place, and global shipments growth is slowing down markedly. Canalys reckons Apple was no.1 in China in Q1 but Xiaomi was in Q2. Here’s a positive review of the new Motorola Moto X and G phones. And Nokia is going to launch a new range of VR cameras aimed at professional content creators. Here’s a list of things in Windows 10 you might want to turn off. It’s a deal: Nokia has sold the HERE Maps, ex-Navteq, ex-Nokia Maps division to the German car industry for €2.8bn. In related news, Uber has been accused of putting fake cabs on its live maps, which it denies. Google is unpicking the links between Google+ and the rest of its products. As well as pulling Google Photos out of +, you won’t need to sign in to other Google apps with G+ if you don’t want to, and Google will stop creating parallel G+ profiles for Google accounts. At the same time, they’re going to integrate mobile traffic data into Google Maps, so you can see how busy that restaurant or whatever will be before you try. Useful, if just a bit creepy, like so many Google products. Vizio’s smart-TVs report what you watch on them. Twitter Q2s are out. The company’s revenue is growing nicely, but MAUs could do better, and it’s still losing money. Here’s an interesting peer-to-peer messaging idea. Is it now beyond question that you should move your unified comms to the cloud? Crypto warriors want a Tor exit in every library. And HitchBot, the little Canadian robot that hitchhiked from Nova Scotia to the Pacific, didn’t make it out of Philadelphia before vandals mutilated the poor thing.